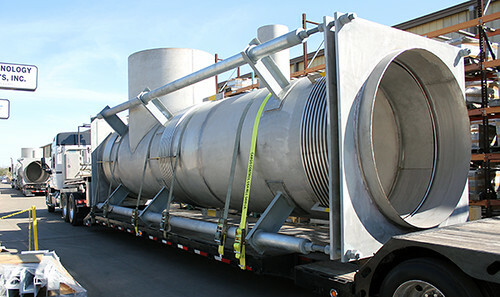 Piping Technology & Products, Inc. By: Piping Technology & Products, Inc.
U.S. Bellows custom designed pressure balanced tee expansion joints for a chemical plant in Texas. The units are 352” overall length, 81” diameter and 90” center line to the bevel-end of the tee. All assemblies were completely fabricated from 304 stainless steel. They are designed for an operating temperature of 392°F at 15 psig, with 6" of axial compression and 1.25" of lateral deflection. The expansion joints were 100% dye penetrate tested and air soap and bubble tested prior to shipment.